It wasn't terribly long ago when Google Home and Alexa Amazon devices were first introduced as the newest additions to our families. These small gadgets are always listening, so they can play your favorite song, tell you the weather, or answer any other questions that may be plaguing your millennial mind. But the flipside to Alexa always listening is that she'll be the first to tell you if she doesn't like what she hears. 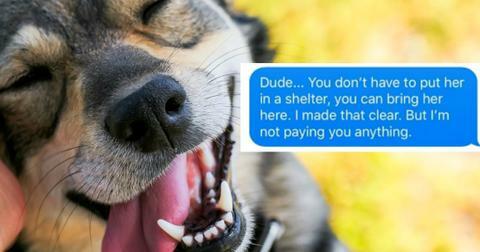 Enter "Intruder Mode," the perfect way to ward off unsuspecting strangers. This feature can turn on lights, music or the TV so that anyone who was going to break in gets scared away. And because these alerts are customizable — and users can program how they want the lighting to change, or what soundtrack they want to play. The internet has discovered some fun ways to play with this Alexa safety feature. Say "What are you doing in my swamp"
Play "All Star, by Smash Mouth"
And once the internet caught wind of this customizable Alexa hack, they couldn't wait to share their own. After all, which burglar would feel great about the lights turning on bright red and hearing the phrase "Do you want to die in here?" upon breaking and entering. 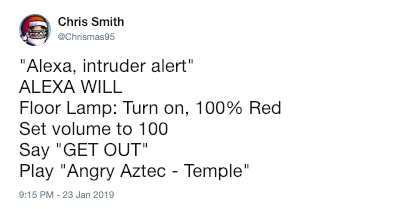 Or, imagine fiddling with a bobby pin to break into a person's house and being hit with a Star Trek line, followed by "Get Cool" playing at Volume 10. Come to think of it, it seems a lot of people are pulling the "Resistance is futile" card. After all, if there was ever a time to quote the Borg's standard greeting to alien races they want to take into their collective, this is probably it. 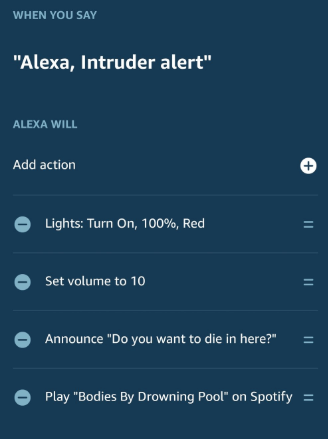 Others are thinking of Alexa's intruder alert in more... pragmatic terms. 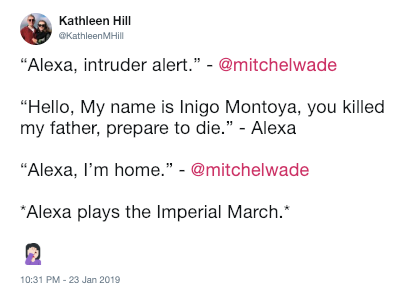 Like this person, who tweeted, "Alexa intruder alert but Alexa plays 'Mass Destruction', which gives you time to take out your sword." 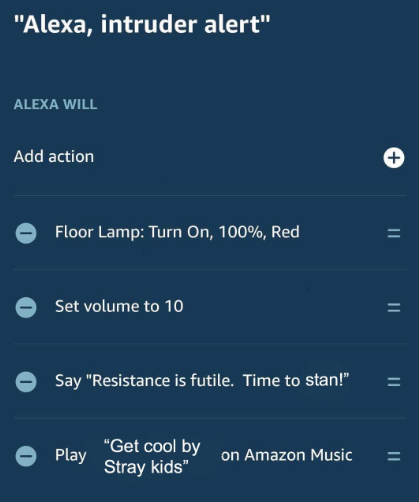 Or this other one, who shared their customized intruder alarm: "When you say: 'Alexa, intruder alert', Alexa will: Floor lamp: turn on, 100%, red; Set volume to maximum; Say 'TIME BOMB SET! GET OUT FAST! 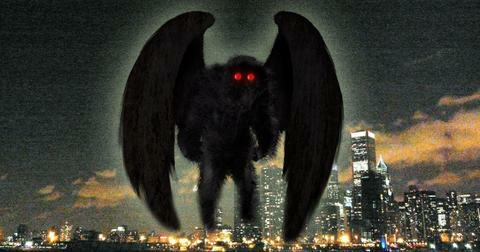 '; Play 'Metroid Escape Theme'." 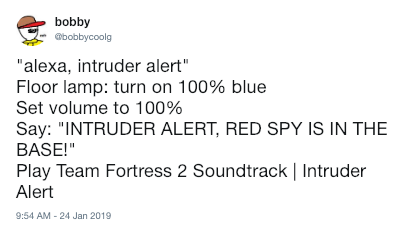 Some people are just discovering this intruder alert through their thoughtless siblings, roommates, or significant others who decided today was the day to freak them out with a start. "Domenico isn’t even home and he just made Alexa go 'Intruder alert. 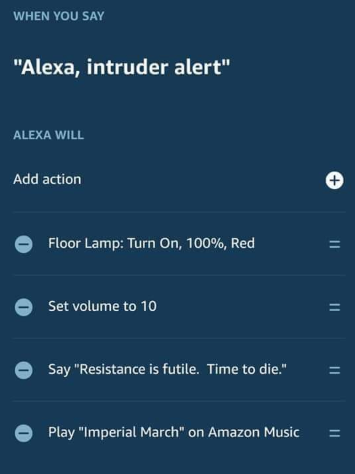 Time for you to die' and our main light turned red and creepy music started playing," wrote one unsuspecting loved one and victim of the Alexa intruder meme. 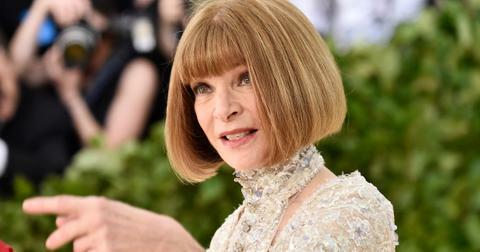 "I wake up to a phone call from Bryce," began another. "B: Hey is your Alexa on? Me: Yes, why? B: Say 'intruder alert' Me: okay why? B: Just do it — This little sh*thead set up my Alexa to play the Star Wars theme song as loud as possible." 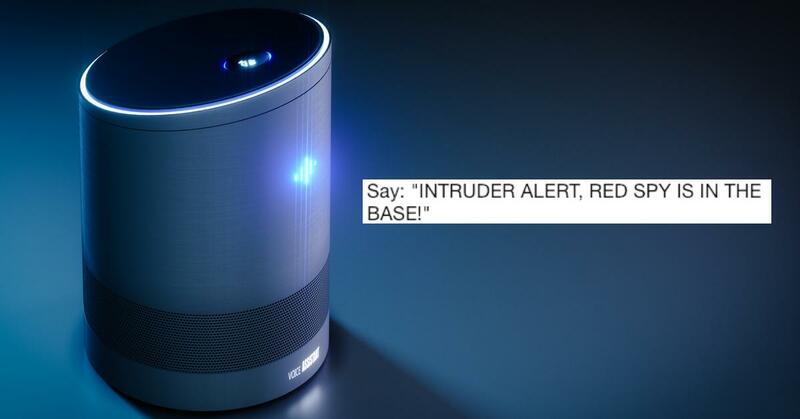 Come to think of it, the next meme I'd like to see reach the proportions of viral fame is one where burglars tape their reactions to Alexa's intruder alert. I imagine a seasoned criminal could come across several different Alexa iterations throughout the course of their career, and wouldn't it be amazing to compile each one in a retrospective of sorts?